Tourism and Antiquities Police in Egypt has recovered a limestone naos (shrine) hidden inside a residential home in Mit-Rahina town in Al-Badrasheen city, south of Cairo. 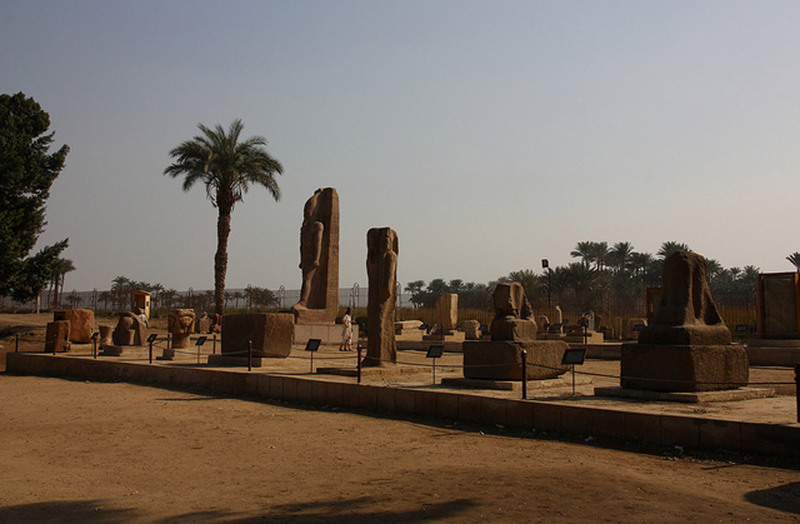 According to the Ministry of State for Antiquities’ archaeological committee, which confirm the naos’ authenticity, the monument dates from the Old Kingdom.It includes four statues of persons fixed on four bases engraved with hieroglyphic verses from The Pyramid Texts. The first statue is 16 cm tall and depicts a standing figure wearing a black wig. The second is 19.2 cm tall and features a person wearing a coloured wig, while the third statue is 9.2 cm in height and may be of a child wearing a coloured wig. On his chest is engraved line of hieroglyphics. The fourth statue is 16.4 cm tall and depicts a person with a black wig. All four statues might depict the same man during different stages of life, according to Aly El-Asfar, deputy head of the Ancient Egyptian department at the MSA. What now puzzles the authorities is where the naos was taken from and under what conditions. Since the monument was located in Mit Rahina, it is highly probable that it came from the area, home to the ancient city of Memphis – cultic centre of the god Ptah and also the capital of Egypt during eight consecutive dynasties during the Old Kingdom. Housing the ruins of Ancient Egyptian, Ptolemaic as well as Graeco-Roman temples and chapels, Mit Rahina archaeological site was subjected to looting in 2011 and then in 2013. The possessor of the naos is now being held in custody and is being investigated.